I made the Olympic loop as a two day ride last summer. Stayed in Port Angles at the Super 8 motel. They were nice enough to let me park my bike under their awning in view of the front desk. Place to eat next to motel. Also stayed near Neah Bay this summer. Stayed at the Bay Motel in Clallam Bay. That is about a half hour east of Neah Bay. Nothing special but was fine and food at the Breakwater next door. Good museum in Neah Bay if you want to learn a bit about the local history. I would definitely get lodging booked ASAP. I have found that weekdays are not too bad to wing it but Friday and Saturday it helps to have a reservation in a lot of these places. Going to Neah Bay and found a very cheap (total of $35 or so) small cabin at an RV place in Clallam Bay. Thx everyone for input and advice. If you have time, go all the way out to Cape Flattery, it's paved. A short hike for views and just beyond and up is an epic viewpoint overlooking the NW tip of Washington, entrance to the Strait, Tatoosh & Vancouver Island. It's dirt to the viewpoint, steep, rutted, might be worth a look, if feeling adventurous. I've only caged to Flattery, but Sk8'd some of it. Also the road to Lake Ozette off of 112 (dead end) is pretty twisty, just west of Clallam Bay. 113 to Sappho off 112, if heading back on the Washington coast toward Forks is fun too, although 112 back to PA is more scenic (less traffic) than 101 around Lake Crescent, but there's a tight twisty road on the east side of Crescent that dumps you back into Joyce on 112 and may be able to get a swim in somewhere. Have a safe ride, thou I imagine traffic might hectic in places with the weather and weekend warriors. They're still putting fish friendly culverts under the road all along Lake Crescent. Weekdays there are closures for construction and single lane stoplights on weekends. You can avoid it by taking 113 and 112. Easy two day ride. Google maps is your friend. Hey, thanks for this b/c it's mostly the route I'm taking. Google Maps is often our friend, but, in your version, it misses some great riding from Astoria to Portland. 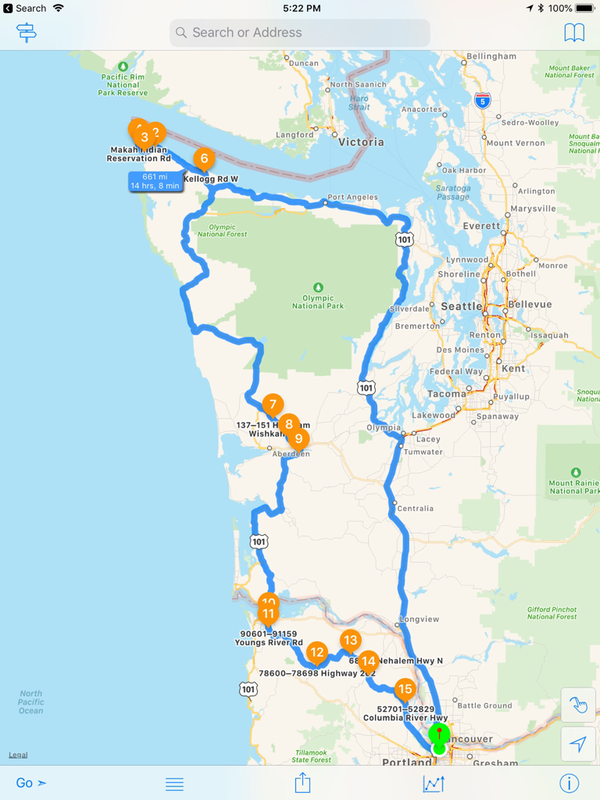 In case you don't know, from Astoria, the way to go is through Jewell and then Mist and then the Vernonia-Scappoose Highway to Scapppose then onto Portland via Rte. 30. Your version is faster on the map, but that is not always the case b/c of crazy traffic on 26 into Portland (even on Saturdays in summer). Rte. 30 has no traffic into Portland. You are absolutely correct, however, the route was intended to be taken clockwise, leaving Portland via 26, and arriving home via I-5. Also, I skipped any roads that were within an afternoon ride of Portland, why spend the time on local roads you've already ridden, when the new ones you want are 6 hours away. Got it. Here’s my route. Ignore the many pins/numbers. I add them to force the routing software (InRoute) to go the way I want. And if you're going to be going through Aberdeen... look up Blue Slough Road, and Wynoochee River Road. When you go through Port Angeles, grab a cup of coffee at Bada NW Coffee shop. Best Mocha I've found. And if you're there for dinner check out Bella Italia. 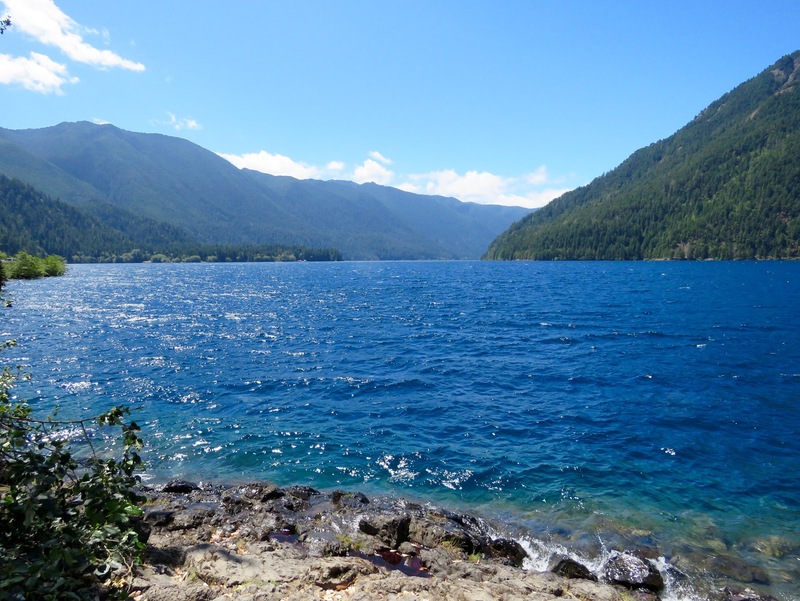 I might suggest looking at the 101 past Lake Crescent instead of the 112. It's a very pretty ride and can be an almost unnatural shade of blue depending on when you see it. The road that runs the edge of it was also just repaved nicely. La Push is also worth the trip if you've never been.